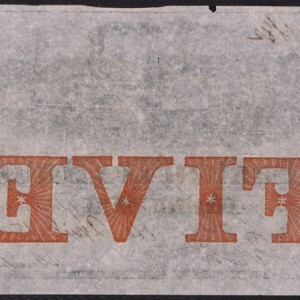 This is an interesting ‘Ghost Town’ note from Nebraska before it achieved statehood in 1867. The town of De Soto was founded in 1855 in the rush to settle Nebraska Territory. For a short time it was a vibrant frontier town and it was even the county seat for Washington County until 1866. 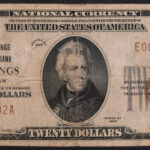 The bank issued notes for several years until its failure in 1862. (Most Nebraska banks of the time failed, as was often the case when territorial populations consolidated and a few strong institutions survived while most weaker ones became superfluous.) The town of De Soto eventually failed as well. The last remaining building located in the Ghost Town the De Soto Store, was razed in 1978. 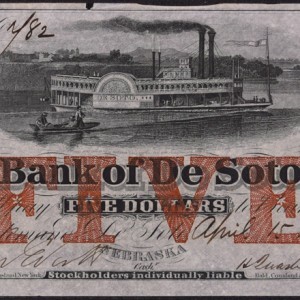 This is a lightly circulated note with beautiful vignettes with the featured image being a steamboat bearing the name ‘De Soto’.